Implementation of the Partnering for Change model resulted in efficiencies within the health and education systems. Children with special needs were seen when their needs were first identified and wait lists for occupational therapy services were eliminated in the schools that participated in the P4C study. 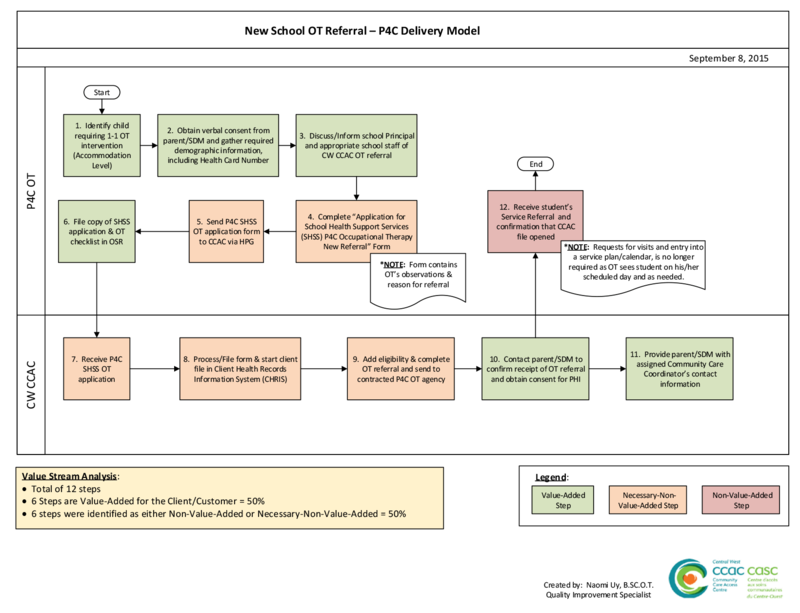 Process diagrams showed efficiencies and “value added” activities within the P4C referral process. The variety of activities and services offered by the P4C occupational therapists (OTs) enabled more children and educators to receive service when needed and at an appropriate level of need. Earlier identification may lead to prevention of secondary consequences. Wait lists were eliminated at no additional cost. A process flow diagram is a tool used by organizations to help pictorially describe the steps needed for specific operations. The diagrams show the key steps required in the process, (the boxes) and who is responsible for the activities (the horizontal rows or “lanes”). Each step (box) is colour-coded to indicate whether activities are “value-added” for a child and their family or not. To be deemed “value-added” an activity must meet three criteria. It must: transform the service; represent an activity of value that the recipient of the service would pay for; and lastly, be performed correctly the first time to avoid additional work. The process flow diagrams shown in Figures 1 and 2 illustrate the actions required when a child at school is identified as requiring school-based occupational therapy (OT). The diagram for the “non-P4C” model shows the processes used prior to the introduction of Partnering for Change; the diagram of the P4C model shows the activities that occurred during implementation of the P4C model. Although both diagrams show the steps required to proceed with the same task, initiation of a referral for school based OT services, the diagrams are noticeably different from one another. The diagram for the P4C model shows there are overall efficiencies (represented by fewer steps) and a higher percentage of steps that are value-added. Figure 1 shows there are four different people/agencies responsible for all of the steps required within the “non-P4C” model. This is illustrated by the four distinct horizontal rows. There are also a total of 26 different actions or steps required; of these 26 steps, only 26% are considered “value-added” for the child and family; 74% are not. In Figure 2, the process map of the P4C model shows that there are only two people/agencies responsible for all of the actions required when a child is identified as requiring P4C services at school. This is illustrated by the process map containing just two horizontal rows (rather than the four rows of the “non-P4C” model). The P4C Model effectively reduces the number of people and agencies by half and illustrates the improved efficiency of the P4C service model. There is also a significant reduction in the number of steps required. There are now 12 steps, rather than 26. Of the 12 steps required to initiate a referral in the P4C model, 50% are now identified as “value-added” for the child and family. This represents a significant and favourable increase in value (Deans, & Wade, 2011). Most importantly, more efficiencies results in less costs. Additional costing information is still being gathered from the two Community Care Access Centres (CCACs) that participated. The efficiencies demonstrated in the process maps are consistent with the feedback received from project stakeholders, particularly within the school boards and participating schools. Educators cited the reduced paperwork required to initiate a referral for P4C occupational therapy services in contrast to their experiences within the traditional, “non-P4C” model of service. In addition to eliminating the lengthy referral mechanisms previously in use, the P4C service was immediate. Children were able to receive P4C services when their needs were first identified. Wait lists were also eliminated in the participating schools. You see the kids sooner, you can make recommendations and corrections so down the road they won’t need you…these children are getting seen in the appropriate place at the appropriate time. Having access to the P4C OT on a consistent basis allowed for strategies to be trialled and tailored immediately to the child’s needs, and avoided time wasted in using ineffective strategies. As capacity is built over time, the OTs may be able to focus on the more complex children who require their specialized knowledge and skills if the educators can support children with simpler needs effectively. The P4C OTs also identified children in need of OT services earlier. Earlier identification and immediate service initiation will likely prevent some of the secondary consequences that we know these children experience. (Missiuna et al., 2014). Prevention of secondary consequences will reduce health care utilization. Early identification and knowledge translation also supports parents in understanding why their child is struggling and reduces their need to seek out multiple referrals and consultations from a variety of health care providers (Missiuna, Moll, King, King & Law, 2007). As a result of the P4C OTs’ knowledge of both human health and the health care system, the OTs can support educators and parents in making appropriate referrals for the children who require additional services. Occupational therapists’ completed an electronic Daily Log for every day they provided P4C services at their assigned research school to record OT services delivered at all levels of the P4C pyramid. A total of 1,207 daily logs were collected in Year 1 and 1,443 daily logs in Year 2, indicating the total number of days that OTs provided service each year. It was very beneficial having an OT in the school this year. It was much more valuable to have on the spot suggestions and strategies about students that she could observe. Students were supported in a timely manner, rather than waiting for a referral to CCAC. The OT daily logs illustrate the many varied activities required of a P4C OT. The types of services provided by the P4C OT differ tremendously from the traditional “non-P4C” model of one-on-one direct service provision. A P4C OT provides activities at three different tiers to support children. Occupational therapy services offered by the P4C OT therefore include: providing formal and informal educational opportunities for school staff, including “lunch and learns” on topics requested by educators; whole classroom Universal Design for Learning (UDL) activities and Differentiated Instruction (DI). These activities are additional activities that are not part of the role of traditional school health OTs yet in this study, and prior research on P4C, have been shown to be important for early identification and capacity building. Figures 3 and 4 depict the percentage of time a P4C OT spends on each activity that comprises her or his role. The number of additional services offered by the P4C OT are striking, especially when this is contrasted with the traditional model of service, where service consists of travel to different schools, direct one-on-one service time, documentation and some communication with parents or the school via a team meeting, and does not include UDL, educational activities or specific activities to build capacity of those around the child. Figures 3 and 4 show that the OT engages in numerous activities in support of educators and the school community. The activities provide additional value for educators at the school, and add to a significant amount of time, particularly when the time spent building educator capacity, on “lunch and learns” and other educational opportunities and on UDL activities is added. These activities differentiate P4C from the other traditional “non-P4C” models of school based occupational therapy. Interestingly, the proportions of how the P4C OT spent her time in both years remained fairly similar, which shows consistency of the service offered during the study. The OTs spent the most time on Differentiated Instruction, documentation and working with children individually. In Year 2, the time spent working with children in a group was more than the time spent building educator capacity, though the percentage of time remained fairly similar in both years; either the third or fourth greatest time was spent on those two tasks. It is important to monitor how this proportion of time changes as continued capacity is built within a school community. Figures 5 and 6 depict the percentage of time a P4C OT spends on activities at the accommodation level of the pyramid. These graphs continue to show the numerous activities the OT engages in, in support of a specific child for whom health care consent has been obtained. The figures show that at the accommodation level, the P4C OT spends the majority of time working with the child individually; completing documentation and/or preparation; working with a child in a group and building educator capacity. There is an increase in the amount of time spent on documentation and preparation (indirect activities) in the second year. This may be attributable to the feedback the P4C OTs received about documentation at the Year 2 “refresher training” or the OTs’ desire to leave children and their families with resources and tools the child can continue to use despite the project finishing. The figures also show that the P4C OTs need to employ additional skills in the P4C model in contrast to the traditional model, to support capacity building and knowledge translation. As noted, mentorship helps to foster that skill development. I think it has allowed me to actually be an OT and not just be a printing teacher or whatever. It allows me to look at a student holistically, it allows me to collaborate with different professionals…again it allows me to bring my skill set and knowledge and work with the team of professionals to the benefit of the…of an individual and look at a much more holistic approach which is very, very nice. I think it’s been the first time where I’ve actually been able to take all the things that I used to tell everybody else to do with the kids and actually put it into practice…so I think putting all of those theories into actual practice has been a huge change for me…and I have to say I feel like I’m actually an OT when I’m doing this. I’m not just kind of a quick consultant in and out. We get to actually do stuff now as opposed to telling everybody else to do it. This is consistent with findings from the demonstration project (Campbell, Missiuna, Rivard & Pollock, 2012). Occupational therapists report much higher amounts of job satisfaction and therefore retention of experienced therapists may follow. This finding and the varied activities that comprise the role of a P4C OT have implications for workload management and planning. I found the P4C OT very helpful this year as she really felt like a part of our staff. She was invaluable in a number of different aspects of our students’ education (e.g. at staff meetings, meetings with parents, drop in sessions for students and teachers, etc.). All of these interactions with her provided the students and teachers with the necessary knowledge, tools and skills for us to be successful!